12 Dates for You and God. 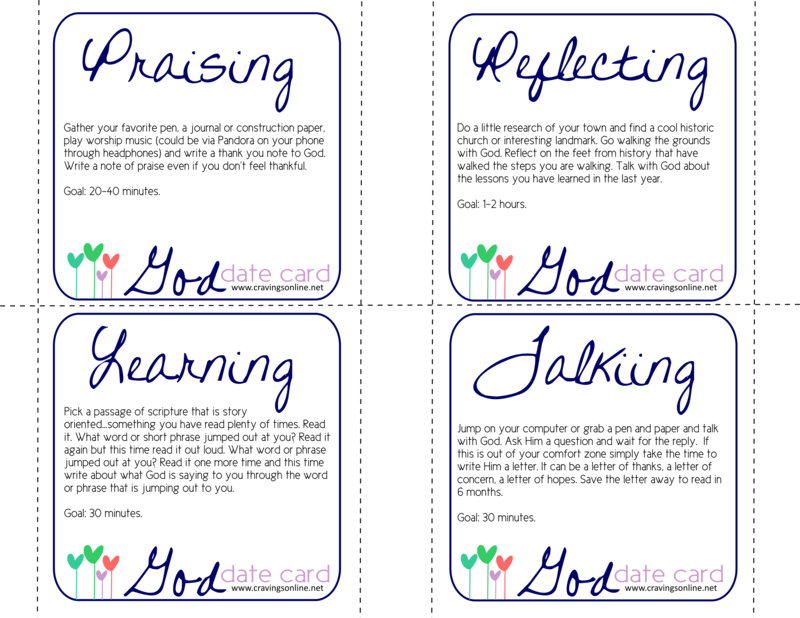 I loved hearing about your very own God dates last week. And I am thrilled to be brainstorming with you. I hope this list inspires you to take God out on a date! Rarely is there money needed for any of the dates. PLEASE tweak them to fit your unique relationship with God. AND I have decided to do top TWELVE so that we have one for every month. I would love to hear about any God dates you go on. Pack up bubbles, side walk chalk, a hula hoop or soccer ball and head to a local park. Roll in the grass, kick the ball with your bare feet, slide down a slide and remember the joys of childhood. Was there something from your childhood that brought you joy that is missing in your life now? Talk with God about it. Goal: 2 hours. Take a nap. Gather a blanket and pillow and find grass to lay in at a local park, fall asleep reading a book in your favorite chair, cozy into your best PJ’s and head to your bed. It doesn’t matter how just find room to rest with God. Goal: 1-3 hours. Using an art medium you like or want to learn more about ( I would choose pastels and a sketch book) read a passage of scripture and then draw, scrapbook, paint, or mold your interpretation of that passage. Do not be hard on yourself just enjoy the exploration with your hands and heart. Goal: 1 hour. One day a week or once a month grab a book from your “waiting to read” pile and read it without interruption. Even if that means finding a way to go hide at a coffee shop or local book store. What did God teach you in that time? Goal: 1 hour if weekly or 2-3 hours if monthly. Download PDF of Date Cards 1-4 or print via Scribd. Gather your favorite pen, a journal or construction paper, play worship music (could be via Pandora on your phone through headphones) and write a thank you note to God. Write a note of praise even if you don’t feel thankful. Goal: 20-40 minutes. Do a little research of your town and find a cool historic church or interesting landmark. Go walking the grounds with God. Reflect on the feet from history that have walked the steps you are walking. Talk with God about the lessons you have learned in the last year. Goal: 1-2 hours. Pick a passage of scripture that is story oriented…something you have read plenty of times. Read it. What word or short phrase jumped out at you? Read it again but this time read it out loud. What word or phrase jumped out at you? Read it one more time and this time write about what God is saying to you through the word or phrase that is jumping out to you. Goal: 30 minutes. Jump on your computer or grab a pen and paper and talk with God. Ask Him a question and wait for the reply. You can see examples of this here. If this is out of your comfort zone simply take the time to write Him a letter. It can be a letter of thanks, a letter of concern, a letter of hopes. Save the letter away to read in 6 months. Goal: 30 minutes. 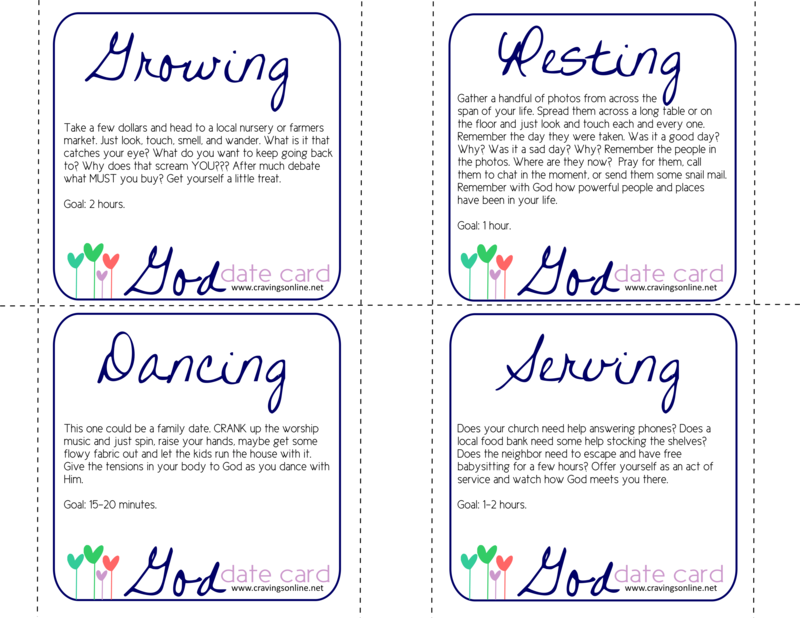 Download PDF of Date Cards 5-8 or print via Scribd. Take a few dollars and head to a local nursery or farmers market. Just look, touch, smell, and wander. What is it that catches your eye? What do you want to keep going back to? Why does that scream YOU??? After much debate what MUST you buy? Get yourself a little treat. Goal: 2 hours. Gather a handful of photos from across the span of your life. Spread them across a long table or on the floor and just look and touch each and every one. Remember the day they were taken. Was it a good day? Why? Was it a sad day? Why? Remember the people in the photos. Where are they now? Pray for them, call them to chat in the moment, or send them some snail mail. Remember with God how powerful people and places have been in your life. Goal: 1 hour. This one could be a family date. CRANK up the worship music and just spin, raise your hands, maybe get some flowy fabric out and let the kids run the house with it. Give the tensions in your body to God as you dance with Him. Goal: 15-20 minutes. Does your church need help answering phones? Does a local food bank need some help stocking the shelves? Does the neighbor need to escape and have free babysitting for a few hours? Offer yourself as an act of service and watch how God meets you there. Goal: 1-2 hours. 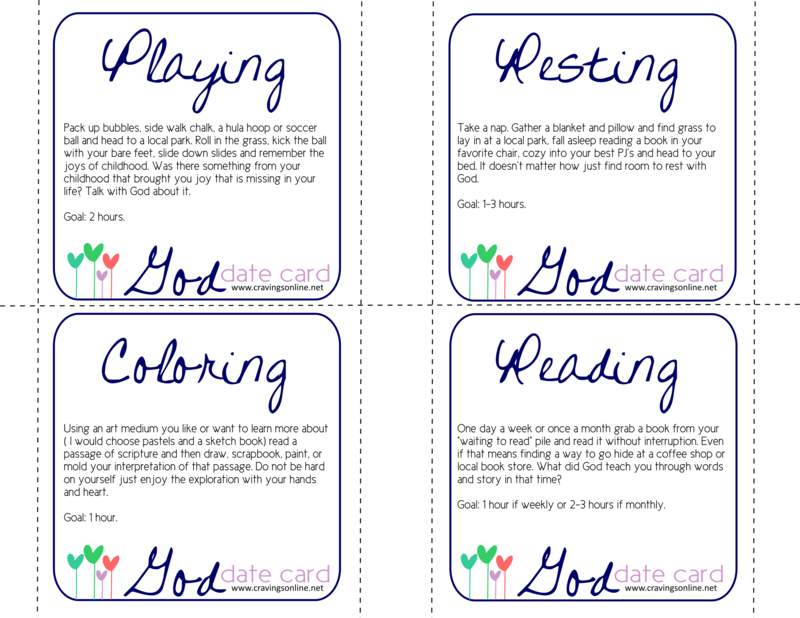 Download PDF of Date Cards 9-12 or print via Scribd.